DOC mystery photo 2: Jackie McMickens & Emerald Pipe Band. Recognize anyone else? Where? Year? Occasion? See commentary below. Click peopled portions of photo for close-ups of band member groupings (left, center, right). Click peopled portions of photo to access close-ups of band member groupings (left, center, right). 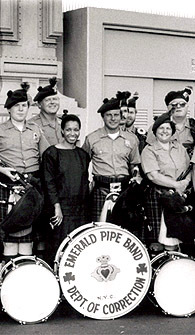 Above are three images sectioned off from a group photo of the NYC DOC Emerald Pipe Band and Commissioner Jacqueline McMickens. The three section images are so positioned as to appear a single image. Clicking on any one of these three section images -- left, center, or right -- accesses a corresponding close-up view of the band members in that section. Commissioner McMickens is in the center section. Each of the close-up section image pages provides navigation links to move between the three close-up view pages or to return to this page. To access the picture as a single (un-sectioned) image, click the image below to the right. Background information about the source of the photo appears immediately below. Some comments and the emerging consensus from emails received since the first posting of DOC Mystery Photo #2 appear further down this page under the subhead "Some Comments on Photo." Some Background on Photo Source. Double click this image to access a 126 Kb JPG full-screen image (single, un-sectioned) of the group, slightly less than 10 inches wide and 8 inches in height. Use your browser's "back" button to return to this page. Retired Correction Officer Investigator William (Billy) Simmonds, who worked as a photographer in the DOC Public Affairs office during the 1980s (one of many posting during his multi-faceted career) provided this photo image to the New York Correction History. The above image of then CO Billy Simmonds, who provided DOC Mystery Photo 2 (the subject of this web page), is based on a detail extracted from DOC Mystery Photo 1, which he also provided. Double click his image above to access the DOC Mystery Photo 1 web page. "My career commenced in 1970 at the start of the riots that engulfed the NYC Correction system. "Later I was involved in many aspects of the Department that most officers never experience, such as being in the Honor Guard and among the first Correction Officers to become a CERT member, then amongst the first four to be permanently assigned as a full-time Cadre under then Deputy Chief of Operations Thomas Murray (along with Officers Fran Patterson, David Schoenfeld and Jerome Signorelli). "Still later, as a Correction Officer Investigator, I worked out of the offices at 60 Hudson St. for the Investigation Division (previously Investigation and Discipline). "At the time I was posted to Public Affairs, not much thought had been given by the Department for maintaining any sort of history," Billy recalled in an email accompanying the digital copy of the photo. "I know that I know some of the officers in the pipe band photo, but their names escape me. I will try to refresh my recollection. "Perhaps a few of the visitors to your Correction History web site might recognize some of the band members and remember their names. For those current DOCers who might wonder about "life after DOC," Simmonds' post-Correction story is instructive. "About the time I retired from the department, I had been temporarily assigned (TDY) to the U.S.Marshals Service working with a 26 Federal Plaza-based Task Force 'Operation Sunrise.' It was a fugitive apprehension detail called FIST for Fugitive Investigative Strike Team. That was in August and September of 1991. "After 21 years plus with NYC DOC, I went to work for the USMS at 1 St. Andrews Plaza. When the new Federal Court opened at 500 Pearl St., I remained there with the USMS for a total of 12 years as a Court Security Officer working in the Magistrate Court." The above image is a close-up view of a sign, partly obscured by a flag on the far left of the band photo. Of course, the fact that Jacqueline McMickens is in the center place of honor in the photo would be a strong indication that the picture was taken during her Commissionership which ran from Jan. 18, 1984 to Sept. 22, 1986. 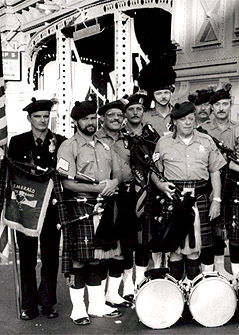 Brian J. Sharkey and NYCD Pipe Band Pipe Major Joe Korber (after consulting with Bob Shaw and Bob Hanley) said the occasion for the picture-taking was an American Correctional Association gathering in NYC during the mid-1980s. 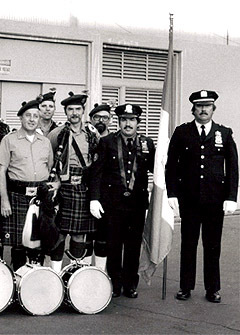 Noting that the pipe band photo setting was the Staten Island Ferry terminal around 1985, Sharkey wrote: "The Department was the hosting agency for the ACA convention." Krober emailed that, "Part of the conference was a cruise around the harbor on the ferry, sort of a meet-and-greet. The band was called out to play on the pier for the arriving guests who were correction officials from all over the country." Sharkey and Korber's references to DOC hosting a correctional conference recalled to this webmaster's mind some stories and photos about such an event. They had appeared in a 1980s DOC newsletter. They were replicated in web format and posted on this site several years ago. A Google search among this site's more than 7,000 files came up with texts and images from two pages of the June 1985 issue of the DOC newsletter Inside Out. 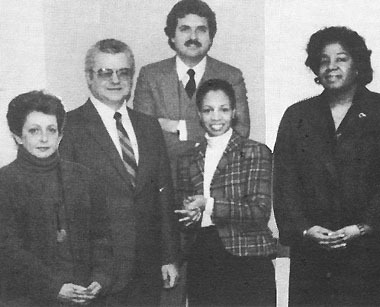 'CONGRESS PLANNERS' was the caption kicker for the June 1985 DOC newsletter Inside Out front page photo of 1985 ACA convention planners including, from left, DOC Special Events Director Sandra Lewis Smith, former DOC Commissioner and CAYSA President William Ciuros, CAYSA Treasurer Michael Theis, DOC Commissioner Jacqueline McMickens, and Chief of Operations Gloria Lee. Click image to access full story, full photo (from which image above was extracted) and the full photo's entire caption. Use your browser's "back" button to return to this page. "The City and its Department of Correction will be on display this August for corrections personnel the nation over who attend the American Correctional Association's 115th Congress of Correction - the first Congress staged in New York City in a quarter-century. "The major body of the Congress runs from Sunday, August 11 through Thursday August 15, and one of the highlights for about 5,000 delegates and guests should be 'New York Night' - a gala evening of entertainment and food aboard the Staten Island Ferry on Monday night, August 12. "A special subway train will shuttle guests between the midtown Congress headquarters at the Hilton and the Sheraton Hotels and the Whitehall Street Ferry Dock. "Once aboard the ferry, guests will have a choice of music and cuisine on three separate decks with a panoramic view of the City as a backdrop - all for just $30 per person. Employees of the Department of Correction may participate in this event even if they are not A.C.A. members or Congress delegates. "If you would enjoy spending a summer's night in New York Harbor, hobnobbing with leaders in the correctional field the nation over, the Department's Director of Special Events, Sandra Lewis Smith, can supply more information . . . ."
The location is obviously near a ferry terminal whose structure is clearly visible in the background. 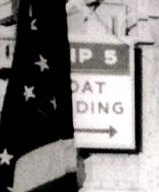 A close-up of the sign, partly obscured by the American flag held by the band member at the far left, reveals the letters "__IP 5. _OAT ___DING" and an arrow pointing to the right. The sign, if not obscured, might have been read as "SLIP 5. BOAT LOADING," meaning the boat loading entrance for Ferry Slip No. 5, yes? But where? South Ferry? Captain Louis Phillips, 25 years with DOC, wrote, "The photo is taken in between the Staten Island ferry terminal and the Coast Guard ferry terminal here in Lower Manhattan." DOC Nutritional Services Public Health Administrator Wing Tsui noted, "The photo could be taken at the front entrance of the U.S. Coast Guard Ferry Terminal adjacent to the Staten Island Ferry. The clue comes from the unique iron structure behind the band." Vincent Valerio stated, "The area surrounding the group is without a doubt the Coast Guard ferry slips at South Ferry." George R. Vierno Center ADW Martin J. Murphy declared, "The photo looks like it was taken near the Governors Island Ferry Slip." NYCD Pipe Band Pipe Major Joe Korber wrote: "The structure in the background closely resembles the old ferry slips where now one gets the boat to Governors Island. Those slips (there are still two) are located adjacent to the relatively new and really huge Staten Island ferry terminal." Implicit in the Korber comment about there being "still two" old fashion ferry slips is that there had been more in the past. If the webmaster's interpretation of the sign detail image (above left) is correct, that the pipe band posed near Ferry Slip #5, then at least three other ferry slips existed when the photo was taken. The history of Lower Manhattan's Whitehall terminal for the State Island ferries traces at least as far back as 1907. Slightly less than a half century later it underwent major reconstruction. It closed for about a year after a disastrous fire in September 1991. Mayor Rudolph W. Giuliani in the fall of 2000 launched construction of a new Whitehall terminal, but 9/11/01 and harsh weather conditions slowed the project. On Feb. 8, 2005, Mayor Michael R. Bloomberg formally opened the new Whitehall Ferry Terminal.